Except for a few large piles in parking lots around town, the snow is gone and tiny signs of spring are evident. Tulip, crocus, and daffodil tips are showing through the brown earth. And evidence of new leaves can be seen on the rose bushes. The sun has been shining and there is 'hope' of spring ahead. With the storms past, Brent and Rylan decided to see if they could snowmobile to the cabin to check it out. Brent wanted to make sure the tree he'd cabled was still standing and to check on the woodshed he spent so much time building last summer. Reports from others who have connections to the mountain are that the powder and drifting was so bad, even snowmobiles couldn't get through. But that was last week. Brent hoped that this week was different. And it was. After much maneuvering over the ruts of four-wheelers who enjoy the rutted and snowy roads as a challenge, they passed the point where the 4 x 4 's gave up and then clear, clean snow was the only hinderance in their path. The snow had melted and frozen enough to eliminate most of the powder, the sun was shining, and it was a beautiful day for trekking upwards. Rylan was a gem and took lots of pictures so I could see what things were like on mountain top. 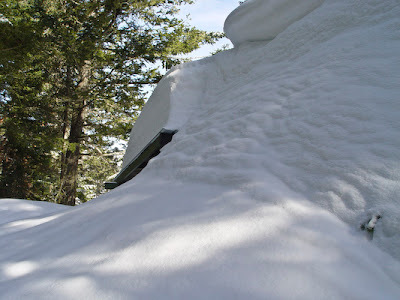 There was 'some cabin' peeking through on the ridge side, but the opposite side revealed only a couple feet of rooftop and lots of drifting snow! The tree was standing like it should be. . .and the woodshed is holding up fine, although the four and a half feet of snow on the rooftop did concern Brent some. He had Rylan help him place a few more supports in the open area from the inside where the snow hadn't reached. Coyotes could be heard from a far away ridge. The bears are hibernating, down deep in their dens under the piles of snow. Rabbit tracks were everywhere, as they are not detoured by snow. 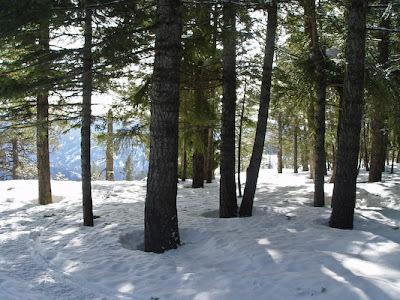 Although some elk and deer tracks were seen around the cabin, they were sparse, as most of them go farther down the mountain to where there is less snow to inhibit their movement (and where there is more food available). It was a calm and peaceful day on the mountain. 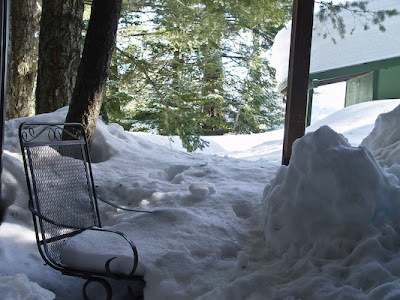 Brent and Rylan ate their lunch at the cabin (but not in the cabin. . .that would have taken too much digging out!). 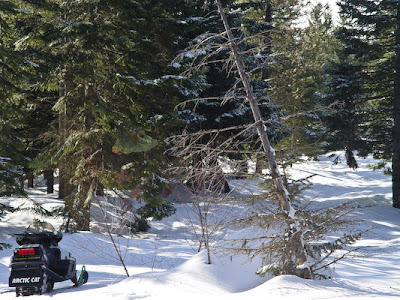 They checked on the neighbor's cabins for several miles in each direction, drove over all the fences and our front gate, and played awhile in the snow (well, the easy way --- on their snowmobiles) and then headed home. Tired and happy, they were happy to report that all was well on mountain top. Oh how fun to see. I have been thinking about your little cabin and how buried it must be !!!!!! 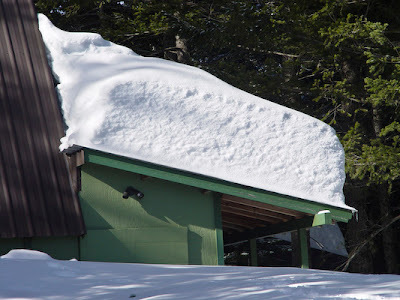 Wow, it makes the snow around our little cabin on the U.P. of Michigan look like nothing compared to what fell at your cabin. That's a LOT of snow. Beautiful photos. OMG - that is amazing. I have not seen snow like that in decades ! Oh my that is a lot of snow! 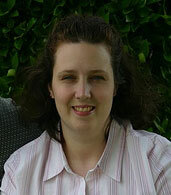 I hope you had a wonderful Valentine's Day! You got so much snow...it's beautiful! Stay warm. Now that looks familiar with all the deep, snowy drifts but I think you have us beat this time. Fun pictures to see! Ohh my what a snow ! !I'm really amazed!!! Wow! I wonder what it was like before it started melting. It must have been such a fun day for your dear ones. It is going to be a while before you can have a picnic by the fire there. Boy, oh, howdy, that is A LOT of snow! We've had snow on the ground since December 1, and I don't know when it is going away, but we've never had THAT much. I'm glad everything is fine. I've heard that the snow in the mountain passes has been brutal this year. I'm glad all is well. I am glad they could get up there. What beautiful pictures of the snow. You can get the full extent of the amount on the roof. We still have places around here people can't get to. The sunny weather today may begin to melt that.